This year I am hoping to step out of my comfort zone and make a real effort to update my wardrobe and ensure that I am dressing for the occasion. As someone who dresses for comfort and practicality, I often feel that a smart pair of jeans and a nice top will do the job whenever we go somewhere nice. The truth is that as soon as we get there I suddenly realise that my outfit choice is somewhat lacking and that I really should have made more of an effort. The Lyst website was suggested to me by the lovely Sabina over at Mummy Matters when mentioned that I was looking to find something special to wear. I’ve got a couple of occasions coming up this year, with the first of them being Piglet’s Christening and I want to look my best. There will be photographs and lots of people to meet and greet I need to make sure that I look the part. I’m on target to lose the baby weight before the big day so I’m going to treat myself to a new dress for the day. Heading over to the Lyst website, I was surprised to find such an array of different designs, colours and price tags to choose from. Whilst I am looking to come out of my comfort zone I do want something that I can wear time and time again with different accessories to make sure I am getting the most out of my purchase and that I feel confident wearing it. 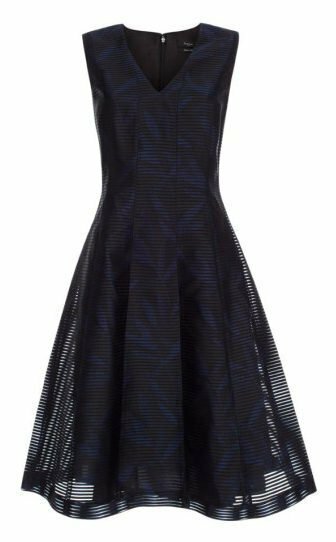 Not wanting to stand out too much I think I have found the perfect dress, a beautiful Black Sheer-stripe Dress With Navy Floral Print by Paul Smith. I adore the shape of this dress and feel it will flatter my pear shape with the full skirt. The floral detailing adds that little touch of interest without being too distracting. Whilst the black and navy colouring allows me the choice of different accessories, from shoes, bags, cardigans/shawls and jewellery. With a wedding, another Christening and a retirement party booked in this year already I think that I could easily find a couple of other occasions to get this dress out and make sure that I’m dressing for the occasion rather than a comfortable pair of jeans – who knows I might actually get used to dressing outside my comfort zone (I do have my eye on this fabulous Armani Jeans jumpsuit – perfect for having fun with the children in the summer). Do you dress for comfort or for the occasion?